Depending on the number of cars you have, you may opt to get an additional garage. As we all do know it’s not good for your vehicles to be sitting out in the weather all year long. As many homeowners, we all are looking to find some place on our property to put all our stuff that seems to keep growing over the years. Considering adding a new or additional garage space may not be such a bad idea. We all can accumulate a lot of stuff over a period of time and not even realize it. No matter how long we live or move from location to location our spaces are cluttered with more junk. Though some of this stuff is valuable and we want it to be available when we need it, however you have to figure out where to put it when you’re not using it. A two-car garage could be your answer and you may be able to get it at an affordable price. How much should a two car garage cost? Honestly this depends on where you go and who you ask. Two car garages can come in sizes 20 x 24 or 24 by 30. Most will have to two doors, a floor, two windows and an entry. 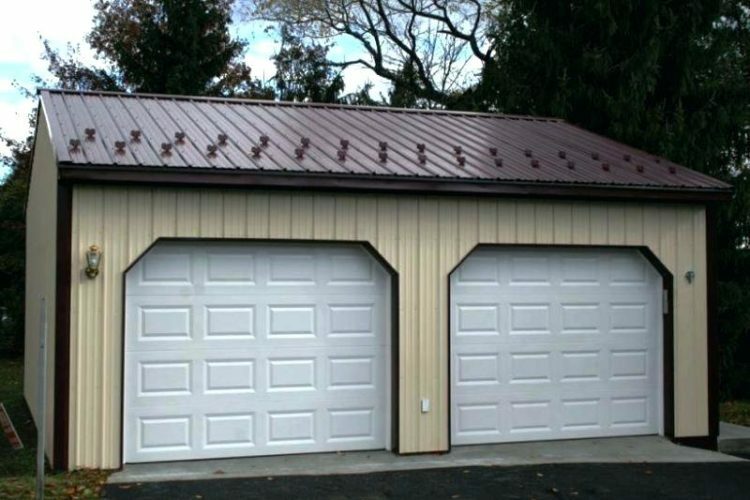 Costs for these types of garages can be upwards to $9,000. A modular garage can have two sections and installation is quick. It’s noted that costs can begin from $50,000 to up to $100,000, depending on what you want and if you customized everything that you desire. Basic structures are normally a permanent two car garage, which could fit your tastes. However, you may still decide on something else. Factoring out the cost could be one reason why you’ve never considered purchasing one. Most people want to spend their money on something they can rely on and find to be necessary. Most two-car garages will not set you back on your budget. They often have a range of choices you can select from. The first step is finding the garage that fits your budget and doesn’t overextend your wallet. Should I Attach or Detach? This can be the ultimate question and it can determine the damage on your wallet. When taking this route, it’s always good to have the trim and siding match the color of your home. If not, you would have to repaint your entire exterior of your home when you decide adding an additional garage. That alone can create more costs. Your goal is to make sure you don’t overdo it and make it look like a smooth addition to your home. Most of these will include two windows, an entrance door and two garage doors. You will have to take into consideration the cost of laying the concrete pad and the location.